‘The end of the Cold War suddenly removed the props which had held up the international structure and, to an extent not yet appreciated, the structures of the world’s domestic political systems. And what was left was a world in disarray and partial collapse, because there was nothing to replace them.’ Eric Hobsbawm, Interesting Times, 2002. Considerable attention has been paid to the impact of the end of the Cold War on Russia and the former Eastern bloc. There has been less work on the countries that were on the other side of the War, in the West and the non-aligned countries and yet for forty years not only international politics but internal national alignments were largely governed by the exigencies of the Cold War. This project aims to trace the on-going and profound consequences of the collapse of the Soviet Union on four countries: Chile, Indonesia, Spain and France. Attempts at settling the legacy of the Cold War have resulted in national Truth and Reconciliation Commissions, prosecution (or attempted prosecution) of state officials, politicians and military officers and the construction of monuments and memorials as sites of memory. They have inspired an outpouring of literary and artistic works, and a flourishing film and documentary industry. 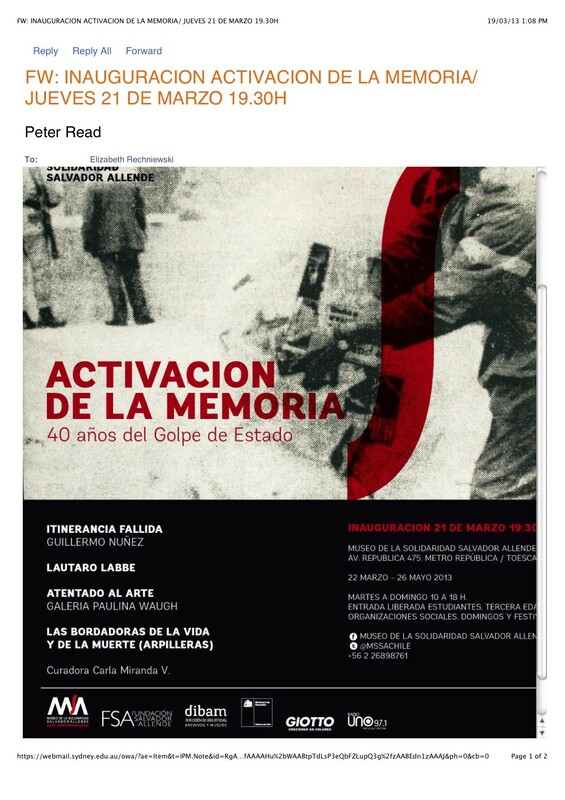 They are often marked, however, by on-going dissent and recrimination, as the past ‘refuses to pass.’ This conference aims to trace these various ways of judging the past both in the countries at the hot centre of the Cold War and in those that were swept up in the wake of its confrontations. How have we and how can we come to terms with a past that is still so present? Registration There are no conference fees. All sessions are open to interested academics. However it would help us to plan the conference if you can indicate that you are planning to attend. Judith Keene: ‘Massacre in Korea’: Picasso’s other Guernica? Tuesday 29 September at Gleebooks, 49 Glebe Point Road. 6 for 6.30-7.30pm. Tessa Morris-Suzuki will launch Historical Justice and Memory. All welcome. Over the last decade there has been great interest in the origins and development of COIN theory and the success or otherwise of its practical application in fields including Indochina and Algeria, not least because of the influence of the ‘French School’ of counter-revolutionary warfare on contemporary American military strategy, encapsulated in (FM) 3-24. In the discussion that has taken place and the books that have been written I have seen, however, very few references in English publications to a war that took place in French Cameroon between approximately 1955-1964. This is not perhaps surprising since even in France the war has been little discussed, overshadowed both at the time and since by the Algerian War of Independence that took place at roughly the same time. Whereas that war has seen a surge of publications, films and documentaries over the last fifteen years or so, the war in Cameroon remains little known and its very existence has been denied by official French spokesmen. Yet it might be of particular interest to military historians as another field in which the French developed and applied their theories of counter-revolutionary warfare. Cameroon, originally a Portuguese, then a Dutch, then a German colony from 1884 until taken over by the French in 1916, did not in theory have the same status as other sub-Saharan French colonies but was mandated to France, along with Togo, by the League of Nations in 1922. The Mandate saw the former German colony of ‘Kamerun’ divided between France and Britain: four-fifths of the territory were given to the French; the remaining land to the West, which contained half the total population, was mandated to the British. Despite its special status as a mandated territory, it was governed in the same way as other French colonies: native Cameroonians were administered from 1924 by the all-encompassing code de l’indigénat that led to the imprisonment of thousands each year for ‘administrative’ offences. In the interwar years, French businesses, administrators and colonists settled in the French section and established large cocoa, rubber, banana, and palm oil plantations: by the 1950s there were some 17,000 white settlers in a population of around 3 million. After WWII it became a United Nations Trust Territory, the mandate explicitly committing France (and Britain) to leading the colony towards ‘self-government or independence according to the freely expressed wishes of the people concerned’. France however continued to treat Cameroon in a very similar manner to her other colonies, including it in the various post WWII forms of Francophone communities, as an associated territory in the Union française and as a member of the CFA franc zone. UN missions would visit periodically and would be taken on carefully prepared tours to assess and report, generally in positive terms, on the progress the colony was making; and both pro and anti-independence Cameroonian representatives would periodically address the UN to put their case as to why independence should be hastened or delayed. Despite French efforts at pre-emptive political reform (predictably resisted by the French settlers), from the late 1940s activism in favour of independence developed and crystallised with the founding in 1948 of the UPC – Union des Populations du Cameroun – a title that represented the attempt to group under one banner the numerous and disparate ethnic, linguistic and religious groups that existed in the country. Its principal demands were for democratic elections, independence within ten years and reunification of the British and French territories and in pursuit of these demands it organised petitions and lobbied the UN and foreign opinion. The extent to which the UPC represented the population as a whole, rather than certain groups in particular (notably the Bamileke), will be the subject of differing interpretations throughout its existence. In its early years it was stronger in the South, which was more urbanised and less traditional, and less dominated by the great chiefs of the North. Seven years after its founding, in 1955, the UPC controlled 460 village or neighbourhood committees and had 100,000 members, far more than other political parties (Teretta 98), particularly on the coast and in central, south and west Cameroon, among the Bamiléké and Bassa. The party published the papers La Voix du Cameroun, Lumière, Étoile and Vérité. and had active trade union (USCC), youth (JDC) and women’s wings (UDEFEC). At the end of 1954, concerned by the growing influence of the UPC, the French government appointed a new, more intransigent High Commissioner, Roland Pré. Pré defined the UPC as the local agent of international communism (referring to it consistently as the ‘PC’, as if the initials stood for ‘parti communiste’) and turned to the new French theories of revolutionary war for inspiration in the ‘rollback’ of the UPC political organisations that had been, in his words, ‘noyautées par le parti communiste’ [infiltrated by the communist party]. In January 1955 he sent a copy of Colonel Charles Lacheroy’s ‘Une leçon de guerre révolutionnaire’ to the territory’s administrators, requesting that they read it with the greatest attention and consider its relevance to the situation they faced in Cameroon. His own views are revealed in his accompanying comments, where he concludes that ‘le Cameroun est en effet le sujet d’une action concertée’ [Cameroon is indeed the object of concerted action] which involves ‘ces techniques révolutionnaires’ [these revolutionary techniques – ie those described by Lacheroy] (Deltombe 154). Deltombe et al argue that in his circular of February 1955 Pré was the first French official to seek to apply in a systematic and coordinated way the tactics of counter-revolutionary war (150), even earlier than its deployment in Algeria. These tactics included setting up parallel hierarchies to challenge the dominance of the UPC affiliated organisations, and a range of counter propaganda measures including educational films and support for regional newspapers that supported the French authorities. Pré authorised the banning of public meetings, constant harrassment and judicial pursuit of leaders, use of informers, police raids and arrests, culminating in the deadly repression of a UPC meeting on 25 May. Continuing violence between members of the UPC, French forces and European settlers led to him banning the party in July 1955 (it was banned in British Cameroon in 1957). The French government was determined to grant independence, if at all, on its own terms, according to its own timetable, and with a government that would be sympathetic to its geopolitical aims and business and resource interests; as the French High Commissioner (1956-58) Pierre Messmer wrote: ‘France will grant independence to those who call for the least, after eliminating politically and militarily those who demanded the most intransigeant line’ (quoted in Poilbout 88). France feared the influence of UPC demands, if successful, on the rest of French Africa and on French commercial interests, and also, Jean-François Bayart points out, as a source of possible support for the independence movement in Algeria (Bayart 452) with which the UPC had some limited contacts. In its reports to the UN, France consistently referred to the UPC as a communist-inspired organisation under the influence of Moscow. The Catholic Church, dominant in Cameroon preached vehemently and constantly against the UPC as a ‘parti politique à tendances communistes’. It is certainly true that some UPC leaders had been influenced by participation in discussion circles run by French communist teachers and trade unionists in Cameroon in the 1940s; they lobbied for support from non-aligned and Socialist countries, received political support from the French communist party and from the late 1950s the guerilla wing was strongly marked by maoism (Deltombe 342). The UPC received however almost no material, logistical or arms support from the Eastern block or other newly independent countries, except for Guinea, who may have supplied them with 40 Czech pistols (Briand 1961). Whether their movement would have been a trojan horse for international communism can never be decided; their initial demands however centred on free elections – in which they would be allowed to take part – with a view to securing genuine independence from France, and reunification with British Cameroon which Ahidjo himself achieved in 1961. 3. in order to favor their disintegration and result in their elimination. Since the rebels had close support from the population, great importance was laid on information gathering which was undertaken by both civilian and military forces: police, gendarmes and soldiers, the feared BMM, brigades mixtes mobiles with patrols by loyal civilians (Prévitali 190). From the late 1950s, administrators and security forces ‘imposed an administrative grid throughout the territory, inventorying neighbourhoods and houses, counting the number of people in each and penalising those who lacked proper documentation.’ Neighbourhood chiefs and block chiefs were appointed and made responsible for security in their area (Terretta 227). The suspect population which, according to High Commissioner Torre ‘se fait complice du terrorisme’ [which is complicit in terrorism] was forcibly removed to camps, and cultivation in outlying areas was destroyed (Deltombe 279). Between 10-15,000 people were herded into stockades along the main roads where they could be easily controlled and separated from the rebels (Le Vine 165; Bieleu 135). A list of inhabitants of the camps was established and checked at regular rollcalls: any individual who happened to be in the wrong house was considered a rebel infiltrator while individuals who were unaccounted for were considered to have joined the rebels and their families or villages punished. Suggestive of the degree of repression exercised against the local population in the late 1950s are the (falsely naïve?) comments of General Max Briand who reported in 1961: ‘Pour des raisons que j’ai mal déterminé, dans tout le Bamileke au début 1960, l’apparition ou le contact d’une unité française plongeait la population dans une peur panique.’ [For reasons that I have found hard to discover, throughout the region of Bamileke at the start of 1960, the appearance or contact with a French unit plunged the population into fear and panic] (Briand 1961). On January 1 1960 Cameroon was the first of the French sub-Saharan colonies to accede to a form of independence as the French, without organising new elections or formalising a Constitution, handed over power to Ahmadou Ahidjo and put in place the secret agreements for defence and military assistance which, combined with the close personal relationships established between French ministers and African francophone leaders, laid the underpinnings of Francafrique. Post-independence the rebellion continued, the UPC considering the Ahidjo government illegitimate; the French ambassador Jean-Pierre Bénard reported in early 1960 that the rebels ‘controlled most of the country’ (Deltombe 403). Ahidjo, drawing on the secret defence agreement with France, requested its intervention to quell the rebellion and maintained the emergency powers and measures that included curfews, control of travel, widespread use of informants, raids and arrests of ‘suspects’ and torture. French and newly trained Cameroonian forces with French officers (many of whom had been involved in the Algerian War: Lieutenant Jacques-Louis Lefèvre, Colonel René Gribelin, General Max Briand and many others) plus colonial troops, continued the fight against the UPC: in 1960 de Gaulle sent 300 officers to coordinate the action and five overseas battalions of colonial troops commanded by General Max Briand (Schmidt 182), armoured vehicles, helicopters and T6 G planes adapted for anti-guerilla warfare. The Groupement Tactique du Nord (Northern command, covering north Mungo and the department of Bamileke) under Colonel Gribelin consisted of 11 companies of colonial infantry, 13 squads of gendarmes, 49 groups of commandos supplétifs: a total of 3,500 men, including 1,500 commandos (Deltombe 404). The Groupement Tactique Sud (GTS) operated in the south Mungo, Wouri, Sanaga-Maritime and Nkam regions under Lt Colonel André Laurière, who advocated the rigorous application of ‘collective responsibility’ to those villages suspected of harbouring rebels (Deltombe 452). The role of French troops was to be kept discreet: on 18 January 1960 Pierre Guillaumat, Minister of the Army sent a secret instruction to the Commandant interarmées that action must appear to be that of the Cameroonian government and forces (Bieleu 148). Although military operations passed officially to Cameroonian command from 1 January 1961, the French retained effective control over the armed forces though the exercise of a ‘military mission’ until December 1964. Amongst the tactics used by the French or by Cameroonian troops and agents with their support were aerial bombardments of ‘rebel territory’, including the use of incendiary bombs (Deltombe 404); targeted assassinations of UPC leaders, both inside and outside the country, including the well-attested assassination of Félix Moumié, poisoned with thalium by a French secret agent, William Bechtel, in Geneva in 1960. The historic leader Ruben um Nyobe had been tracked down and killed in 1958; the execution of Ernest Ouandié marked the end of the rebellion in 1971. Throughout the period of the rebellion, from 1955 on, the French then the Cameroonian authorities exercised political control over the population through censorship, press seizures, and the French secret service: the SDECE (Service de Documentation extérieur et de Contre–Espionnage) and SCEDE-Afrique created in 1960 by Maurice Robert with a Cameroonian branch, le SDESC. Arbitrary arrests, torture and public executions took place in a score of internment camps, including Mantoum, Tcholliré, Yoko. Le Monde journalist Philippe Decraene reports the display of the heads of executed rebels in public places in 1965 and writes of the terrified silence that had descended on the population in the wake of the exactions of both authorities and guerillas. The rebellion petered out in 1971, having degenerated into sporadic acts of violence as isolated guerilla groups were tracked down and eliminated. While it is extremely difficult to establish reliable casualty figures for the whole period, General Briand gives the figure of 21,000 Cameroonian dead in 1960 alone, including 6,000 fighters, 10,000 who died as a result of ‘internal combat’ (not defined) and 5,000 who ‘died of illness’ (in camps?). The authorities in British Cameroon estimated civilian deaths in the period December 1956 to June 1964 at between 61,300 and 76,300, 80% in the Bamileke region alone (Terretta 1); UPC estimates range upwards from 200,000 for all the years of the conflict. Whatever opinions may be held of the justification of the guerilla war waged by the UPC, and the violence which it also inflicted on the local populations, there is no doubting that what took place in French Cameroon between 1955 and 1964 was ‘une terrible guerre civile’ in the words of J-F Bayart (452) in which French and Cameroonian troops deployed counter-insurgency tactics that had been honed in Indochina and, more or less contemporaneously, in Algeria. The interesting questions include whether these tactics were applied as the theory dictated, and whether they were ‘successful’. They were deployed arguably at great cost to the democratic evolution and economic development of the nation, which has remained an autocratic, corrupt and impoverished country to the present day. The war in Cameroon has been researched in great depth by Thomas Deltombe and collaborators in Kamerun! Since this work is not available in English, the author has attempted to summarise the principal phases and nature of French military intervention, using this and other sources. She is not a military historian but is motivated by the belief that the war deserves to be better known in the English–speaking world and in the context of discussion of COIN theory and practice. She welcomes comments, corrections and additional information that would advance this knowledge. As this is intended as a discussion paper and not a full-length article she has limited the footnotes and restricted the references to works cited. Atangana, Martin (2010) The End of French Rule in Cameroon. Lanham,Maryland: University Press of America. Bayart, Jean-François (1978) ‘L’Union des populations du Cameroun et la décolonisation de l’Afrique ‘française’’. Cahiers d’études africaines, vol 18: 71, 447-457. Bieleu, Victorin Hameni (2012) Politique de défense et sécurité nationale du Cameroun. Paris: L’Harmattan. Deltombe, Thomas, Manuel Domergue and Jacob Tatsista (2011) Kamerun! Une guerre cachée aux origines de la Françafrique. Paris: edns La Découverte. Le Vine, Victor T. (1964) The Cameroons, from Mandate to Independence. Berkeley: University of California Press. Poilbout, Aurélien (2014) ‘Sub-Saharan Africa: a Key Issue for France in the Cold War’ in Toyin Falola and Charles Thomas (eds), Securing Africa: Local Crises and Foreign Interventions. NY/London: Routledge, 83-136. Prévitali, Stéphane (1999) Je me souviens de Ruben: Mon témoignage sur les maquis camerounais 1953-1970. Paris: edns Karthala. Schmidt, Elizabeth (2013) Foreign Intervention in Africa: From the Cold War to the War on Terror. Cambridge: Cambridge University Press. Terretta, Meredith (2013) Nation of Outlaws, State of Violence: Nationalism, Grassfields Tradition, and State Building in Cameroon. Athens,Ohio: Ohio University Press. From the title of the ten-page circular of 4 February 1955. ‘Une mise en garde des évêques du Cameroun contre les activités des communistes’, Le Monde, 8.04.55. Jean Le Guillou, « Une pacification réussie : la réduction de la rébellion upéciste en Sanaga maritime (Cameroun 1957-1958)». ‘Plan of Action for the Sanaga-Maritime’ presented by Lamberton and approved by Doustin and Gl Le Puloch. Quoted in Atangana, 62. Xavier Torre, High Commissioner from February 1958, quoted in Bieleu, 141. Deltombe et al, ch 15: ‘ZOPAC (1): regrouper et endoctriner’ and ch 16: ‘ZOPAC (II): traquer et exterminer’ describe in detail these methods. The presence of these planes is attested by Previtali, 161, a road engineer who gives extensive technical detail of their adaptation. Long suspected, the operation was admitted by General Paul Aussaresses in Je n’ai pas tout dit. Paris: Edns du Rocher, 2008, 106-8. Philippe Decraene, ‘Le Cameroun en quête de paix et d’unité’, Le Monde 12.03.1965. Recent films from Chile/Cuba, Catalonia/Spain, France/Algeria and Indonesia explore the troubled legacies of the Cold War. The themes that the films evoke carry a powerful resonance today: the violence and disintegration as a consequence of revisiting the past; the moral ambiguities of counter–insurgency warfare; the tragic fate of children struggling to come to terms with their parents’ political commitment; the complex challenges posed by reconciliation and forgetting after civil war. This mini film festival is part of the ARC transnational research project “Judging the Past in a Post-Cold War World”. Area specialists from Sydney University, UTS and ANU will introduce each screening. Highly controversial for the ethics of its production and its intervention in contemporary debates about Indonesian history, The Act of Killing focuses on the history of the mass murder of communists in 1965 as the event is remembered by perpetrators and victims. Long before Iraq, Afghanistan and the ‘war on terror’, the techniques of counter-revolutionary warfare were honed in the dying throes of the colonial empires. Set during the Algerian War, Mon Colonel explores what can (and must?) be justified in the cause of counter-insurgency and the price it exacts on those who conduct it. Set in rural Catalonia, after the Spanish civil war, Villaronga’s powerful film uses the central figure of a child to expose the fear and hypocrisy at the heart of Franco’s Spain. Without sentimentality, Pa Negre, lays out the insurmountable challenges confronting those who attempt to transcend the violent compromises of that era. In the late seventies, exiled militants of MIR, the Left Revolutionary Movement, returned to Chile to support the fight against the military dictatorship, leaving 60 of their children in the care of ‘social parents’ in Havana, Cuba. The film confronts the unbridgeable gap that exists in Chile today between the revolutionary dreams of the MIR generation and the children of the post-dictatorship generation. Warning: these films depict graphic scenes of violence and torture. Admittance is restricted to those 18 years and over. This workshop is sponsored by an Australian Research Council grant with the support of the University of Sydney and the University of Technology Sydney . Germany circa 1990. A stamp is dedicated to the 1st anniversary of the fall of the wall. Posted on 07/03/2013 1 Comment on Germany circa 1990. 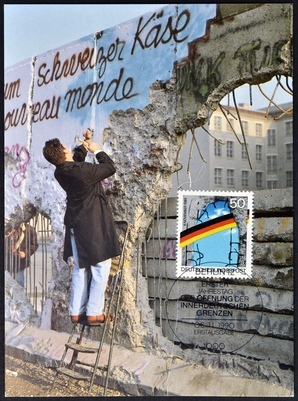 A stamp is dedicated to the 1st anniversary of the fall of the wall. Henry Rousso, La dernière catastrophe: l’histoire, le présent, le contemporain. Paris: Gallimard, Nrf essais, 2012. Pp. 338. 21 euros. Henry Rousso’s essay offers a wide-ranging reflection on what it means to write the ‘history of the present’, a field which, in recent decades, has moved from the margins of history to its very centre. His aim is to trace the evolution of the ‘history of the present ‘, the forms it has taken and the problems it has posed over the centuries and poses now. In his first chapter, Rousso outlines the historiography of the history of the present: he explores what it meant to write this history in classical times, in the middle ages, in ‘modern’ times – a term which, he notes, is open to uncertain dating. But the principal focus of the book is to trace and explain the emergence of a particular form of the history of the present from the 1970s on, with a focus on the French, German, English and American historical fields (although, understandably, the French field receives most attention). Discussing the evolution of the theory and practice of the history of the present in the late twentieth century, Rousso pays close attention to the impact of the two World Wars, these ‘catastrophes’ that placed new demands on the historian and transformed the relationship of public and historian to the past and to the present. The trauma of WWI encouraged the public’s engagement with history and accorded an increasingly prominent role to ‘witnesses’, as veterans demanded that their experience be remembered – and never repeated. Rousso notes the collections that were begun in the midst of the war, to preserve the items, documents, etc that might capture the experience of the soldiers and the brutal reality of combat. The Australian reader is reminded of the role that Charles Bean played in ensuring that such items were collected from the battlefields towards the end of WWI, and his campaign for the establishment of a permanent institution of memory and record that became the Australian War Memorial. Bean saw such a memorial as, in part, fulfilling his notion of a debt owed to those who died, and this notion of a debt owed to the victims is one that, Rousso argues, began to emerge in the aftermath of WWI and even more strongly after WWII. The recent past became the object of increasingly close attention after WWII, in the context of the war trials, the ideological confrontations of the Cold War and the construction of the European Community. But it is above all from the 1970s that the history of the present became a major preoccupation both in the discipline of history and amongst the public and media as war crimes and above all the extermination of the Jews re-emerged as central preoccupations of academic focus, public commemoration and judicial examination. A ‘second wave of purges’ took place in France, with the trials of Barbie (1987), Touvier (1994), Papon (1997), drawing historians into playing the role of expert witness and even moral arbiter. Nuancing Hartog’s category of ‘presentism’, Rousso argues that it is less the hegemony of the present that characterises our contemporary collective imaginary, than the persistence of a past that summons us to pass judgment and ensure compensation for events that took place several generations ago, as if they were contemporary. How to define the boundaries of the present? Where does it begin? Rousso’s title, La Dernière catastrophe [The latest catastrophe] contains his answer: catastrophic events force the ensuing generations to attempt to re/write their recent history, to give meaning to the rupture with the past, to re-establish individual and collective identities (251). In his final chapter, Rousso reviews the various candidates for the catastrophic events that might mark the start of our ‘present’ – 1917? 1945 ? 1989? 2001 ? If it is still too early to assess the impact of the terrorist attacks on the USA of 2001, the events of 1989/1991 seem to Rousso to mark the end of the cycle that began in 1917 with the Russian Revolution. Finally, what does Rousso say about the nature of our contemporary approach to writing the history of our present? This particular conjuncture is characterised by five principal features: the weight of the (catastrophic) events; social demands on the historian; judicial involvement; the importance attached to witness and to memory. Rousso reflects on the challenge posed to history by those who claim that direct experience trumps the perspective of the historian: his book opens with an anecdote that suggests the extent to which the witness to an event is felt to have a special insight that the historian cannot replicate, a prejudice shared even by certain historians. Rousso stands firm for the role of the historian in combatting the immediacy of events through the mediation that history offers, though he does not under-estimate the challenge involved in establishing a sufficient critical distance. It is impossible in this short review to do justice to this very rich and detailed reflection on such a wide range of topics and issues in the theory and practice of the history of the present: the problem of periodisation; the reasons behind the contemporary ‘era of commemoration’; the increasing attention paid to WWI since the 1990s ; discussion of the work of other major historians such as René Rémond and Pierre Nora. It is to be hoped that an English translation will soon be available to ensure wider access to this work. that conflict similarly affected a range of political and cultural fields in many diverse locations.